Did you avert your eyes because this is a Christmas title popping up in October? I always struggle over whether to feature Christmas items before December actually hits. I mean, yes, I am already listening to Christmas music (and enjoying it, thank you very much!) but there are some people who legitimately think we are rushing the season a bit. If you are one of those, I'm hoping you'll forgive me since a giveaway is included. Tend to the yard in the front of your house so that it looks attractive and well-kept during the Christmas season. Create a space to hide Christmas presents (and remember where that space is). Truly, there are only a few pages of tips but they are things that are useful to be reminded of (in my humble estimation). Then, we mentioned, there are pages for you to fill in. She gives you space to keep track of the events you are planning to attend (school/church/business, etc.) with space to write out which outfit you are planning to wear so you can have things clean and pressed in time for the event. There are pages for you to write down appointments (doctor/hair, etc) for yourself and your children. She also includes pages for grocery lists and, of course, presents to buy. In the section for November she reminds you of specialty items you might wish to buy (i.e., balloons, wrapping paper, etc.) as well as a very handy reminder to schedule babysitters for any adult only events during the Christmas holidays. (I scheduled a babysitter for one event already and also bought scotch tape. GO ME!) This is, again, followed with pages for you to fill in reminding you who you need to send cards and letters to, items that still need to be purchased, etc. As I mentioned above, I've seen holiday planning books before but this is the most thorough I've come across. I like that it's short and simple. There is not much to read (but what there is is handy to think about) and a lot of space to write in so as to help you keep track of things that are completed and those that still need your attention. 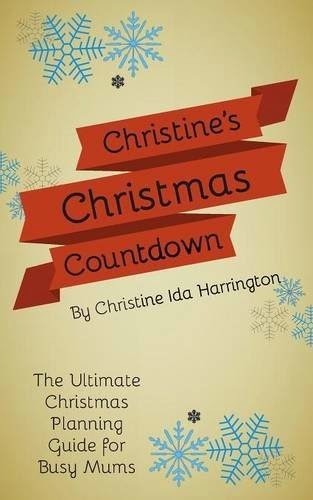 Furthermore, Christine's Christmas Countdown is available at a reasonable price making it even more appealing. THIS CONTEST IS NOW CLOSED. THE WINNER (as selected by Random.org) IS *Carrie*! Congratulations! Here is my early wish that you have a fun and well-organized holiday season which you enjoy thoroughly! Many thanks to Mrs. Harrington who sent a copy my direction in order to facilitate this review. I received no additional compensation and my opinions expressed are entirely my own. Sounds fun. I love Christmas, and I love planning and lists! I love Christmas and always have the issue is I have a large family and people come in from all over and well things get a bit nuts at times.